On Monday, August 27, 2018 at approximately 12:06 hours, Fire District No. 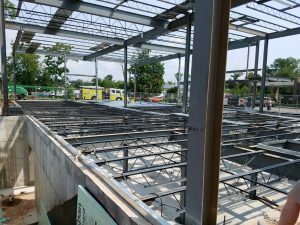 1 was dispatched to an EMS assist with a worker who had fallen approximately 12 feet into the basement of a commercial building under construction. Engine 561 and the FM-8 units arrived and conferred with RWJ EMS and devised a plan. The basement was only accessible via a steep dirt slope at one end of the basement. A 24′ extension ladder was laid on the slope to allow the patient on a backboard to be hauled up the slope to the awaiting ambulance. Chief 56, Chief 26, Van 26 and FM8 units successfully retrieved the patient from the basement. The patient was received by EMS and transported to the hospital with non-life threatening injuries. On Monday, August 27, 2018 at approximately 09:54 hours, Fire District No. 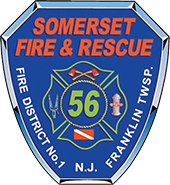 1 was dispatched to a smoke condition at 6302 Minuteman Circle. 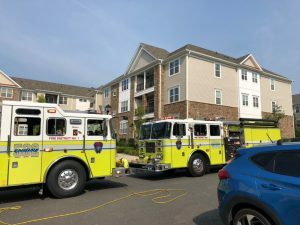 While responding, a 2nd fire alarm activation from the same building. A precautionary 2nd alarm mutual aid request was made. Upon the arrival of FM8-E (Mickelsen) it was determined to be unattended cooking on the 3rd floor in apartment # 302. 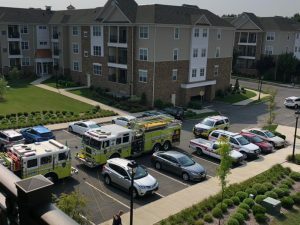 A heavy smoke condition was present in the apartment and 3rd floor hallways. At that time the 2nd alarm was cancelled and an extensive ventilation operation was started by Engine 561, 562, Car 56 and the FM8 Units. No fire damage occurred, units remained on the scene for approximately 60 min.